Vision statement: Our vision is to develop emergency physicians that provide the complete spectrum of emergency care in diverse settings and communities while advancing the field of emergency medicine. Mission statement: We provide residents with comprehensive training in current and cutting-edge emergency medicine practice in a diverse, high-acuity setting. We endeavor to promote a culture of continuous improvement, collaboration, and wellness. We value culturally competent care and engagement with our institution, specialty, and community. 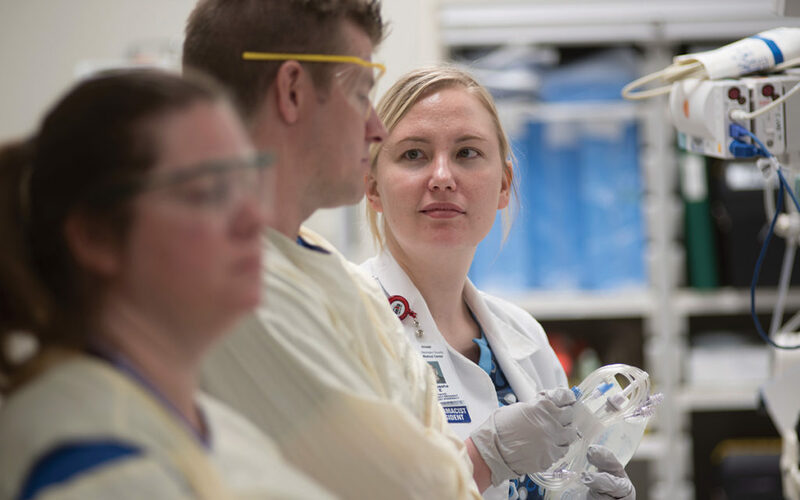 Few programs offer the hands-on critical care experience, resident autonomy and access to state-of-the-art medical technology as the Emergency Medicine Residency at Hennepin. Launched in 1972, our program is the second-oldest in the U.S.—and still at the forefront of critical care education and training. From day one, you will assume critical decision-making responsibilities in a supportive, collaborative, and fast-paced environment. You will interact with dedicated faculty and provide care to a diverse population that includes both urban and underserved individuals, as well as trauma patients from across Minnesota and neighboring states. Since Dr. Ernie Ruiz founded our program more than 40 years ago, HCMC has offered physicians one of the most comprehensive Emergency Medicine experiences available. Our three-year curriculum delivers outstanding critical care experience in a high volume, fast-paced Level I Trauma Center. Our approach gives you hands-on learning opportunities early, working side-by-side with experienced professionals in a collaborative environment. As an academic healthcare system, HCMC places strong institutional value on education and research. During rotations, Emergency Medicine residents experience ample protected time for didactics and conferences, to create a well-rounded learning environment. We update our curriculum regularly to incorporate resident input, the latest research, and the newest techniques and equipment. Your education with Hennepin will include training with advanced technology such as emergency ultrasounds and hyperbaric medicine, as well as rotations in neurosurgery, MICU, NICU and training in toxicology with the Minnesota Poison Control Center, run by HCMC. The Emergency Medicine program offers an average of 5.5 hours of didactic experience weekly. Our residents take advantage of stimulating conferences and study groups, online videos produced by our residents and faculty, and opportunities for one-on-one training and career mentoring. The quality of discussion and caliber of cases makes our weekly Critical Care (STAB) conference one of the most popular programs in the entire hospital, attended by residents and practitioners from other disciplines and viewed online by clinicians around the world. Our pioneering Research Associate Program enables busy residents to undertake clinical projects while maintaining regular duties. Student volunteers, called RAs, staff the Emergency Department 24/7 to qualify and enroll patients in clinical studies. Our faculty and residents perform approximately 10-20 active clinical projects each year. EM Core Content Curriculum covers key EM topics, given by faculty, PGY-3 residents or invited speakers, on both adult and pediatric topics. There is initially a 12-month PGY-1 core content curriculum, covering foundational EM concepts. This is followed by a 24-month senior resident curriculum, expanding on these foundational topics with additional focus on resuscitation and emerging literature, and incorporating additional intriguing topics. EKG & Radiology curricula is also split by PGY level, with a 12 month introductory curriculum, followed by a more advanced 24 month senior resident curriculum. Chief complaint / “Great catch” conference where residents present interesting cases with strong teaching points. Additional subcurricula include case-based learning & improvement (CBLI), toxicology, medicolegal, documentation, quality improvement, culturally responsive healthcare, “lessons from the specialists”, clinical practice variation, combined emergency medicine – internal medicine conference and more. PGY-1 “Reading Group” meets weekly with faculty to review algorithmic approaches to common EM complaints from emergency management textbooks and other educational sources. PGY-1 residents complete a 1-month rotation in pediatric emergency medicine (PEM) at Children’s Minnesota, one of the “Best Children’s Hospitals” in the nation. This is a high-volume pediatric emergency department, with pediatric Level 1 trauma center accreditation and high-quality board-certified PEM physicians. This rotation has been very well reviewed and allows the residents to develop a solid foundation in PEM. Thirty-six full and part-time faculty lead the Emergency Medicine Residency. Our program is affiliated with the University of Minnesota and all faculty hold university appointments. In addition, our faculty hold multiple leadership positions at Hennpin Healthcare and play an integral role in our healthcare system’s operations. From our comprehensive airway program to our cutting-edge ultrasound training, every day our faculty share their dedication and expertise in a variety of key disciplines. Learn more about our faculty and their individual areas of expertise. Our residents take an early and active role in patient care and obtain decision-making roles quickly. Within the Emergency Department, residents direct the initial stabilization of all critical patients, including trauma cases, and oversee all critical care. Residents manage all airway interventions, procedural sedation, orthopedic reductions and stabilizations, and other key procedures. Third-year residents put their clinical training, communication skills and team leadership into practice with the year-long "Pit Boss" responsibilities. This invaluable opportunity allows PGY3's to supervise junior residents, PAs and students, and coordinate Emergency Department operations. PGY-1 residents provide care to all non-critical patients in the Emergency Department. Residents take a history, perform a physical examination, and formulate a diagnostic workup and management plan. PGY-1 residents present every patient to a senior resident or faculty, and procedures are performed with an appropriate level of supervision. North Memorial is a private, community-based Level I Trauma Center in the Twin Cities. This experience provides exposure to a different patient population and system of operation with great critical care opportunities. The first week of this rotation is Hyperbaric Medicine, allowing PGY-1 residents to learn the basics of Undersea and Hyperbaric medicine as well as dive with patients in our state-of-the-art hyperbaric chamber. The subsequent three weeks of this rotation are spent in the Neonatal ICU, giving residents the opportunity to care for sick neonates and obtain increased experience and comfort with procedural skills in this population. All residents complete the Neonatal Resuscitation Program (NRP) prior to this rotation. During one of the most highly praised off-service rotations, residents will work on a team with a second year EM resident and critical care fellows and attendings. Call is every fourth night and opportunities for acute care, resuscitations, and invasive procedures abound. At HCMC, general surgery is trauma surgery. Residents take trauma call every fourth night with the surgical team. Residents care for trauma cases as well as emergent and elective surgery patients, both on the floor and in the Surgical ICU. There is ample opportunity for invasive procedures during this rotation. TOXICOLOGY: One week is spent in the Minnesota Poison Control Center, learning various aspects of emergency toxicology through didactic and experiential learning activities. The MN Poison Center provides support for Minnesota, North Dakota, and South Dakota. EMS: An understanding of Hennepin EMS dispatch and ground services is acquired and includes an ambulance ride-along and an optional air medical experience. QUALITY IMPROVEMENT: A Quality Improvement (QI) project of the resident's choice will be designed and completed, and subsequently reviewed by a QI faculty member. SPECIALTY CLINICS: Several half-day specialty clinic experiences have been developed, where procedures and management strategies important to emergency care are emphasized. ULTRASOUND: One week is spent with dedicated EM ultrasound techs and ultrasound faculty, allowing for development and refinement of basic and advanced bedside ultrasound skills. The majority of time in this rotation is spent on labor and delivery, where residents are supervised by OB/GYN senior residents and attendings. Responsibilities include managing acute obstetrical concerns in patients greater than 20 weeks gestation, as well as patients in labor through delivery. Clinic time is spent assessing and treating patients with obstetric and gynecological problems. PGY-2 residents exercise more independence and are responsible for primary patient evaluation and managing non-critical and semi-critical patients. PGY-2 residents initiate evaluation and treatment independently, with oversight from senior residents and faculty. PGY-2 residents assist PGY-3 residents in managing critically ill or injured patients and perform procedures commensurate with their level of training, under close supervision by PGY-3 residents and faculty. Efficiency, departmental flow, and task-switching skills grow significantly during this year. Residents broaden their experience with different patient populations and operating procedures during this rotation. This is a continuation of the first year rotation, with an even greater opportunity to undertake procedures and manage critically ill patients. Abbott-Northwestern (ANW) is the largest private hospital in the Twin Cities. It is home to the 'Minneapolis Heart Institute', one of the world's leading heart institutes, and is the busiest cardiac center in the upper Midwest. ANW is also one of six comprehensive stroke centers in the Twin Cities. The hospital treats many complex medical patients including heart transplantation and ventricular assist device recipients. At ANW PGY-2 residents work with one to two attending providers during each shift. The rotation provides residents the opportunity to expand their approach to the high acuity patient as well as provide exposure to an additional community Emergency Medicine experience. Residents also develop competency in working with scribes to provide and document patient care. HCMC operates a Level I Trauma Center widely recognized for outstanding neurosurgical care. PGY-2 residents handle all Emergency Department and hospital consults and diagnose and treat neurosurgical emergencies from across the Twin Cities and the state. As patients with significant neurosurgical injuries are often also critically ill or injured, both critical care and neuroimaging interpretation skills can be expected to grow tremendously during this rotation. Residents have the unique opportunity to explore an EM subspecialty that may be of interest in their PGY-2 year. All of HCMC’s fellowship programs (Undersea and Hyperbaric Medicine (HBO), Emergency Medical Services (EMS), Toxicology, Ultrasound, Simulation/Education, and Research) offer two-week selective experiences. Residents will be part of a team comprised of a chief surgical resident and two interns, handling all Emergency Department and hospital consults, as well as evaluating and admitting all trauma patients while on call, and co-managing SICU patients. PGY-2 residents rotate for two weeks at the University of Minnesota Masonic Children’s Hospital Emergency Department (UMCH ED). The UMCH ED, staffed with high-quality board-certified pediatric emergency medicine physicians, allows residents the opportunity to see a broad range of pediatric patients, from those with acute injuries or illnesses to those with chronic and rare conditions. EM PGY-2 residents serve as the senior resident on MICU teams. Responsibilities include providing and overseeing care for all critically ill patients on that team, often supervising both an EM intern and a medical student. Call is every fourth night. PGY-3 residents in the "Pit Boss" role evaluate and manage all patients in their team center within the Emergency Department. PGY-3 residents supervise all patient care delivered by medical students, physician assistants, and junior residents, and provide care directly to a small number of patients. Supervision of care includes verifying important aspects of the patient’s history and physical examination and being involved in all diagnostic and therapeutic management decisions made by junior residents, PAs, and students. This also includes supervising procedures, triaging patients on arrival to the team center, managing overall patient flow, teaching other trainees, and providing medical control to Hennepin EMS. Faculty supervise PGY-3 residents. PEDIATRICS: Residents continue their experience at the University of Minnesota Masonic Children’s Hospital Emergency Department (UMCH ED) with another 2-week opportunity to care for sick children. CARDIOLOGY: For the other two weeks of the rotation, residents act as cardiology consultants for the entire hospital. Choose a selective in anesthesiology, community emergency medicine, critical care, EMS, radiology, research, toxicology, simulation/education or another pre-defined subject. Or, create your own selective with program director approval. Three international selective slots are available annually, with resident salary and benefits included. Our residents take an early and active role in patient care and obtain decision-making roles quickly. Within the Emergency Department, residents direct the initial stabilization of all critical patients, including trauma cases, and oversee all critical care. As part of our program, you will manage all airway interventions, procedural sedation, orthopedic reductions and stabilizations, and other key procedures. Third-year residents put their clinical training, communication skills, and team leadership into practice with a year-long "Pit Boss" responsibility. This invaluable opportunity allows you to direct patient care during actual Emergency Department operation. In year two, residents attain significant leadership roles in the MICU and supervise medical students in off-service rotations. Like our facility, our curriculum integrates the latest equipment. You will learn and utilize our bedside ultrasound program, advanced airway equipment, hyperbaric chamber, interdisciplinary simulation and education center, and other state-of-the-art tools as part of your daily routine. From the weekly critical care conference to day-to-day work in the Emergency Department, residents interact with staff from numerous departments and specialties. We maintain a long tradition of cooperative, non-hierarchical teamwork that leads to low anxiety and great patient care. We believe that having a diverse physician workforce is an asset in caring for a diverse patient population. In recognition of this, the Department of Emergency Medicine Diversity Committee consists of faculty and residents that meet regularly to discuss promoting diversity in our faculty and residencies, reflection on unconscious bias, and examination of systemic issues that impact the care of our patients. Understanding that burnout in medicine has reached “epidemic proportions”, with nearly 70% of Emergency Medicine physicians reporting burnout and 50-70% of residents reporting the same, we have formed an EM Residency Wellness Committee. This committee has worked on various initiatives focused in areas that have been shown to improve wellness or decrease burnout. Some examples are 1) events to increase the social interconnectedness and sense of community within the residents and faculty, 2) Equilibrium sessions, to provide a forum to discuss and process some of the repetitive microtrauma that is inherent to providing emergency care, 3) systems-based interventions such as improving scheduling patterns so residents can maximize their time off and have more sustainable workloads while on shift, 4) actively soliciting areas of frustration or waste identified in the work environment and improving ED processes, as well as many others. Submission: Submit your application through the Electronic Resident Application System (ERAS). Contact your medical school's student affairs or dean's office for instructions. We do not accept applications through the mail. HCMC participates in the National Resident Matching Program (NRMP). The Emergency Department is located within the main HCMC campus, which spans five city blocks in downtown Minneapolis. We handle cases at all levels of severity, including day-to-day emergencies and disaster response. We also provide the entire spectrum of care for injured patients, from pre-hospital care and transport through rehabilitation.